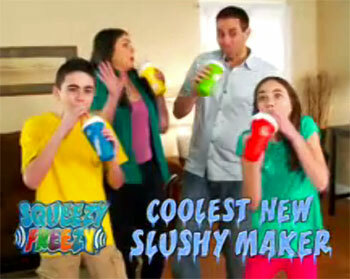 Unlike many ads for kids’ products, the infomercial for the Squeezy Freezy slushy maker spares us an annoying cutesy jingle. Instead, it subjects us to a mangy beast of indeterminate origin who suddenly sneaks up behind children. The star of the Squeezy Freezy commercial is something named “Eddie.” He is not referred to as “Eddie the Abominable Snowman” or “Eddie the Arctic Slushy Monster,” just Eddie. Presumably this creature is supposed to be called “Eddie the Yeti,” but he is never referenced that way during the infomercial. At least they had the good sense not to use his full name, Sir Edmund Gordon Farnsworth III. Eddie’s wardrobe comes courtesy of the rattiest costume the producers could fish out of a dollar store dumpster. They wouldn’t even let the costume be padded with a pillow, so dedicated are they to making this slushy maker available at the low, low price of $19.99. Squeezy Freezy assures kids that they can “get slushified”a term that sounds a lot like “get sloshed.” And if the behavior of the family shown engaging in a group sip is any indication, then these slushies are definitely spiked with something. 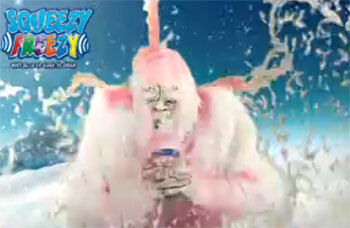 The slushy liquid that keeps getting dumped on the kids’ heads throughout the Squeezy Freezy commercial is reminiscent of both the “slime” on the Nickelodeon show You Can’t Do That on Television and the bucket of blood scene from the movie Carrie. The producers of the Squeezy Freezy infomercial need to seriously consider remaking the miniseries It with Eddie in the Pennywise role. The kids could end Eddie’s reign of terror by slushifiying him. 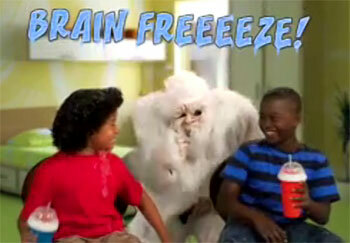 “Brain freeze” is a good thing? That’s a new low for marketing hubris. Wow. First time I’ve ever had to worry that an infomercial would give me nightmares. This does not work at all. I let my daughter use it, and it just stayed juice. WHAT A RIP OFF!!!!!!!!!!!!! !